It was a June day in 2012 and Cage Fighting Johnny was behind with the rent. The landlord of the part-renovated warehouse off the Fountayne Road near Seven Sisters where Johnny had been living had turned up with friends in tow and started unloading Johnny’s wares into a skip outside. Johnny, off somewhere initially at the time, got wind of the situation and turned right back up, post haste, friends of his own, all multi-coloured hair and elaborate piercings, along for back-up. What ensued resembled a bizarre kind of theatre, a ritual in which different tribes – the cage fighting punks, the orthodox Jewish landlords, the crack-smoking property guardian in the caravan in the courtyard, the congregation at the African church upstairs who would regularly get shut out of their own space and simply turn up the next day with bolt-cutters and force their way back in – all came together and faced each other down in a series of performative stand-offs without possible resolution. He started to assemble hierarchies. Hierarchies of theorised spaces – the ‘non-places’ of Marc Augé, the ‘any space whatever’ of Gilles Deleuze, the ‘other spaces’ or ‘heterotopias’ of Michel Foucault, ‘awkward spaces’, ‘spaces without function’ – and hierarchies of materials – the plywood which shutters the concrete, the concrete that supports the steel, and the steel which ultimately supports more and more high embodied energy materials like aluminium, plastics, glass, and other types of cladding. These continua would form the basis of diagrams in a publication from the following year, I Can Be Yours on Allotrope Press, mapped against degrees of dissonance and sterility. But what, the question became, is the middle term here? What is the ground that supports the conflict between these different types of spaces and different types of material? What is made possible in their midst? In the book, there are photographs of shop windows masked by a complex weave of packing tape in dense, quasi-pictorial cross-hatching; plastic sheeting draped over bike sheds; wooden sheds erected up scaffolding; dens of tarpaulin and breeze blocks in the shadow of gleaming concrete blocks. 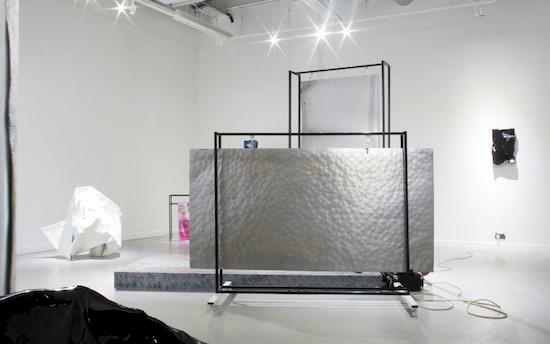 Alongside these images, there are shots of some of Winter’s work from the period: quasi-architectural forms in plastic sheeting and plasterboard, gaping holes, like punch marks, rending them apart; a found plane of corrugated metal exhibited on a wall like a portrait; fractal geometries in silvered card. Born in Northern Ireland in 1980, Winter studied architecture, first at Queens University in Belfast, later at Edinburgh College of Art. 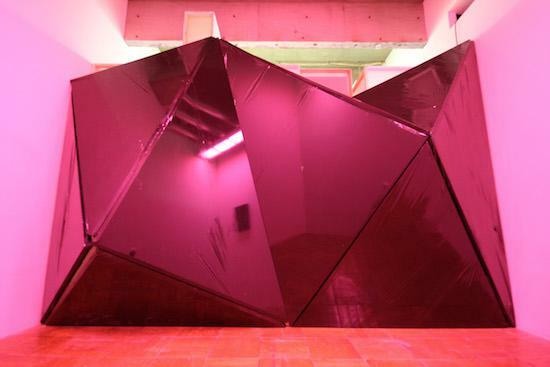 It was at the latter that he met curator Clémentine Deliss and became embroiled with her Future Academy, an experimental international research forum, and through that, met Los Angeles-based sculptor and installation artist, Oscar Tuazon, who Winter cites as one example of an artist who worked with precisely the kind of unfinished, dissonant materials that would inform certain aspects of his Handyman PhD. I first came to Winter’s studio several months ago when he was hosting a small private performance. At that time the place was crowded with a dozen or so people around its peripheries with a drum kit and two huge steel plate reverbs either side. The walls were adorned with brightly coloured boxes, hammered into irregular shapes. In a kind of preview for a later performance at Cheltenham’s Hardwick Gallery (for his show On Becoming Fluid with Merike Estna), he hammered rhythmically upon drums and steel plates, processing the sounds through a daisy chain of cheap guitar fx boxes, playing along to beats sampled from early nineties house tunes. In other similar performances – at, for instance, Mexico City’s Galeria Breve – the brightly-painted boxes themselves have become the drum kit, their shape and form determined by the hammering action, itself determined perhaps by the rhythms and timescales of Chicago acid trax like Adonis’s ‘No Way Back’. Unlike other contemporary artists, like, say, Tarek Atoui, for whom creation of self-made instruments indistinguishable from sculpture becomes subsequently the occasion for a (musical) performance, it is here the other way round. Not the object which generates the action, but the action which generates the object. You could relate the work, then, to the time-base theories of John Latham. The work becomes the crystallisation of the time of its production – only instead of the one second flash of a spray can's trigger, it's the seven minute rush of a house 12".